* Bonus Track. Stereo Version. To purchase WAV or FLAC digital downloads of this album using PayPal, please click the "Add To Cart" button below. After your order has been placed you will receive an email within 24 hours with a download link which you can then use to download your purchase. Please specify WAV or FLAC audio file format at the time of placing your order. 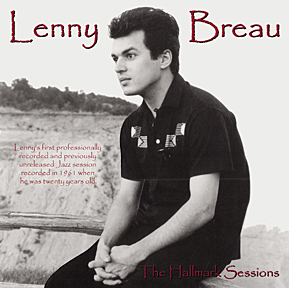 "The Hallmark Sessions", recorded at Hallmark Studios in Toronto, Canada on November 28, 1961, were recorded when Lenny Breau was only twenty years old. This is Lenny's first professionally recorded Jazz session and, until now, has never been released. The original analog reel-to-reel master tapes have been in the possession of Lenny's former manager, George B. Sukornyk, for over forty years. In addition to several Jazz standards such as: It Could Happen To You and I'll Remember April, Lenny also performs several solo Flamenco and Country & Western pieces, as well as four previously unheard original compositions. Lenny recorded seven tracks with acoustic bassist Rick Danko and drummer Levon Helm, both former members of the group The Band, as well as six solo guitar pieces at Hallmark Studios. In addition to the trio and solo tracks, there are also six bonus tracks that contain the Stereo versions of the trio pieces. All tracks have been professionally mastered using 24-bit digital technology. I have often wondered what is the measure of greatness in a musician. My observations of Lenny Breau, his development and acceptance as a guitarist of world class stature was not only a combination of audience adulation and repeated words of praise such as "genius", but also the utter surprise of fellow artists, musicians and peers when they heard him play for the first time. Over a period of two years or more, I witnessed first hand the reaction of Don Francks, Joey Hollingsworth, the CBC house band in Toronto, Moe Koffman at George's Spaghetti House, Stompin' Ronnie Hawkins at his home, Ed Sullivan's manager and son-in-law in New York, John Coltrane at Birdland in New York, Tony Bennett at the O'Keefe Center in Toronto, and many others. My first encounter with Lenny was when I went to Jack Shapira's great Jazz Club, The Stage Door, in Winnipeg, Manitoba in October 1961, at the urging of his friend and mine, Joey Hollingsworth. I met Lenny, a diminutive, friendly young man of twenty, with fine handsome features and dressed immaculately in black. What I heard that evening, which added to my appreciation of Jazz, was a level of playing far beyond what I had expected. He was not a "single-pick" player as most Jazz guitarists of the day, but rather, by the use of his fingernails on his playing hand, that were carefully shaped as picks, played combinations of intricate chords and unbelievable runs, with some Flamenco thrown in for good measure. At the end of the evening, which lasted into the early morning, I spoke at length with Lenny and told him he was wasting his time in Winnipeg. I invited him to come to Toronto, stay at my home, and told him I would arrange a recording session so that we could use the tapes as a promotional demo. Lenny flew to Toronto in early November 1961. I booked a recording studio at Hallmark Studios for November 28, 1961. On the day before, I made arrangements to take Lenny to Ronnie Hawkin's home in Mississauga, in order to rehearse with Rick Danko, acoustic bassist, who played for Ronnie, and Levon Helm on drums. The rehearsal lasted about two hours with Lenny quickly running through the numbers with Rick and Levon that he contemplated recording. "The Hallmark Sessions" were recorded on November 28, 1961. Lenny, Rick Danko and Levon Helm recorded the seven Jazz numbers in stereo. Lenny then recorded the two Country & Western numbers and the four Flamenco numbers in mono. What was astounding to the recording engineers, and to everyone present, was that Lenny played the entire Jazz session without any rehearsal or interruption. After a short coffee break, Lenny played the Country & Western numbers, changed guitars, and played the four Flamenco numbers - again, without rehearsal or interruption. What has been produced on this CD, is in my estimation, the purest and finest work that Lenny ever performed or recorded. The two original master tapes were boxed and marked by Hallmark with the date November 28, 1961, and the name LENNY MARTIN. Lenny was caught up in the excitement of recording, and thought he should change his name to one that was less difficult to pronounce and more appropriate for show business. He chose the Lenny Martin stage name perhaps because of Dean Martin's popularity at the time. This makeover was short-lived, and Lenny went back to use his given name soon after "The Hallmark Sessions." In March 1962, when Lenny and his family moved from Winnipeg and stayed at my home, I had the pleasure of seeing and listening to Lenny practice and play for hours every day. This went on for months, interspersed with sessions with Don Francks, Lenny and Ian Henstridge, who named themselves 'Three', and in turn led to the famous Purple Onion session in Toronto. There are two vignettes of importance that I recall and had the privilege to be part of in the spring/summer of 1962. The first vignette was a meeting that I arranged to have Lenny meet Tony Bennett on a Saturday morning at the O'Keefe Center in Toronto. Tony was rehearsing for a final evening performance and I had asked him to listen to Lenny. It was about ten in the morning on the stage of an empty auditorium, with only Tony, his piano player, Lenny and myself. Lenny's playing so impressed Tony that he asked Lenny to join him immediately as a permanent member of his tour for a three-year stint. Later that evening, I drove Tony to the airport (then called Malton) and had to tell him that Lenny turned him down. Many years later, I learned that Lenny said it was the biggest mistake of his life. The second vignette was when Lenny and I were in New York, and on a particular evening, decided to drop in at Birdland to hear John Coltrane. (Coltrane was about to record, or had just recorded his album "John Coltrane Live at Birdland"). After listening to a set, Lenny, who invariably carried his acoustic guitar with him, approached Coltrane and asked if he could sit in. I recall John looking Lenny up and down and at some of the group, and they nodded their consent. This acceptance, without knowing anything about Lenny, who could have been a dud for all they knew, was typical of the mutual respect and brotherhood between musicians. It must be remembered that Coltrane's Jazz in 1962 was better known for experimentation, including playing the same chord three or four different ways within a single measure, as well as overlapping chords, before the change was intended to occur. This type of eccentric and unorthodox playing, which most musicians and guitarists could not comprehend, nor play, appealed to Lenny. The rest of the evening with Coltrane and his group was also memorable. When Lenny sat in, after plugging his guitar into one of the speakers, he initially just played chords to get a feel for what was happening. In the following number, when Lenny's turn came to play, the effect was electrifying. Coltrane leaned over with eyes wide-open, looked at Lenny's hands, and smiled. During the remainder of that session, which lasted for at least another two hours, Lenny played with authority with the great John Coltrane, and on many of his licks, Lenny led the charge. "The Hallmark Sessions" tapes have been stored behind several wine-racks for the last forty-one years, and since then, only listened to for the first time on June 20, 2003, with Paul G. Kohler, the Producer of this CD. Lenny's playing brought back a flood of memories, his laugh, his infectious stutter, his phenomenal ability to play Jazz, Flamenco, Country & Western, my friendship with him and the thought that I had had the privilege of having known a truly great guitarist. Lenny Breau's life was cut short. He will be missed, but not forgotten. I can't thank you enough for producing this CD. It brought back a flood of memories Lenny & I shared onstage and off. In my estimation, that was vintage Lenny as I remember him. I think that was the cleanest, purist he ever played. It was also when Lenny developed his signature licks. His prodigiously rapid single lines, gorgeous harmonics and polytextural wizardry never sounded as fluid or assured as they do throughout these 13 tracks. No guitar aficionado should pass this up. Rarely would we classify a recording as a must have, however in this case order now! Long after the death of this important guitarist, his recordings still remain important artifacts of one of the greatest musicians to ever play the instrument. His improvisation and creative genius was in a league of its own. "The Hallmark Sessions" is a fascinating CD! His amazing finesse, coupled with his synthesis of country feel and jazz sophistication, should've set the world on fire. Art of Life Records has added another essential chapter to the history of Lenny Breau with "The Hallmark Sessions". Lenny, who had only been playing jazz for a few years, shows a surprising mastery of the genre. ... the level of musicianship here is astonishing. The wealth of material from this previously unreleased 1961 studio session by guitarist Lenny Breau is amazing. Adding to to the value of this highly recommended CD is the detailed liner notes and analysis of his work. At the center, clearly, is this hot-to-trot guitarist, who displays the hellbent energy and swagger of timeless greats like Django Reinhardt and Charlie Christian. The recordings predate Breau's hitherto "first" LP, "Guitar Sounds From Lenny Breau", by seven years and yet they're far more than merely formative performances. The guitarist is immediately identifiable by his touch and technique -- a diamond in the rough, perhaps, but recognizably a diamond all the same. "The Hallmark Sessions" is an extraordinary release. Breau plays beautiful chords (sounding a little like Johnny Smith in spots) and inventive single-note lines. It is remarkable that this music was not released until 2003, but a happy event that it was finally put out. This is a must for Breau fans and an important release for all jazz guitar lovers. The mostly jazz tunes indeed show the genius of Breau's playing and point the way to his landmark albums, such as 1969's debut, Guitar Sounds From Lenny Breau. Listening to this album makes it easy to marvel at the genius of Lenny Breau. He was just 20 when this session was recorded, but already the magnificent technique he later became so famous for was well formed. Breau in a word is awesome and to think that his playing was this developed at such a young age is mind boggling. The fast runs, the polyrhythms, his adeptness at accompanying himself while playing lead and his proficiency at slipping from country to jazz to flamenco and back are all here. The "Hallmark Sessions" are the beginning piece of the Lenny Breau legacy. Midway into "I'll Remember April", we are convinced that Breau could burn on guitar as well as anyone and with endurance. He plays swinging country bluegrass, a bit of blues, "Oscar's Blues", cookin' bop and flamenco. While we preferred the burners, the intensity that Lenny brought on made all of his tunes enjoyable. Lenny was born to play guitar and this 1961 session captures him near the beginning when he was already a virtuoso. Unfortunately, he spent the greater part of his life in Canada away from the jazz mainstream. I take my hat off in respect. It is amazing to hear how effortlessly Breau moves from one genre to another, exhibiting mastery in all of them. He was not yet 21 years of age at the time of the recording. This is the work of a genius in the making. His technical ability is matched by his imaginative conceptual approach to the music on this album. Lenny is one of my all time favorite's. I thank you folks very much for bringing this CD to the world. Lenny was unbelievable. Just got the new Lenny Breau CD a couple of days ago. What can I say! The guy just blows my mind! I can't believe the guy was playing as good as he was so early on. I knew the CD would be good, but it far exceeded my expectations. Many thanks for making this gem available. Love the new Lenny Breau! Congrats on continuing to spread the sounds of one of the most unheralded of guitar giants.To hear him cross every musical boundary and genre from THAT early on is just astonishing.